pollinator gardens: the Serviceberries are blooming in Kathy's Grove! We planted on a beautiful May 5. Most of the trees we dug in were still dormant but the three Serviceberries were already in bud. Sunday it rained, which was great for the new tress and shrubs, but today, Monday, has been cool and brilliantly sunny. I went down to Stanley Park and sure enough the Serviceberries had popped into bloom. 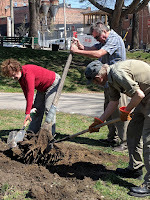 One of the great things about arriving at the park was to find Harry Roach and his crew from City of Toronto Parks watering the trees and shrubs. Kathy's Grove is far from any taps, so they had rigged up giant plastic barrel in a truck and were watering in the plants. Many thanks, Harry and crew! Harry was great on Saturday. He and the park supervisor, the great Brian Green, had brought a sod stripper. This machine looked like a shrunken locomotive hooked up to an oversized lawnmower engine. 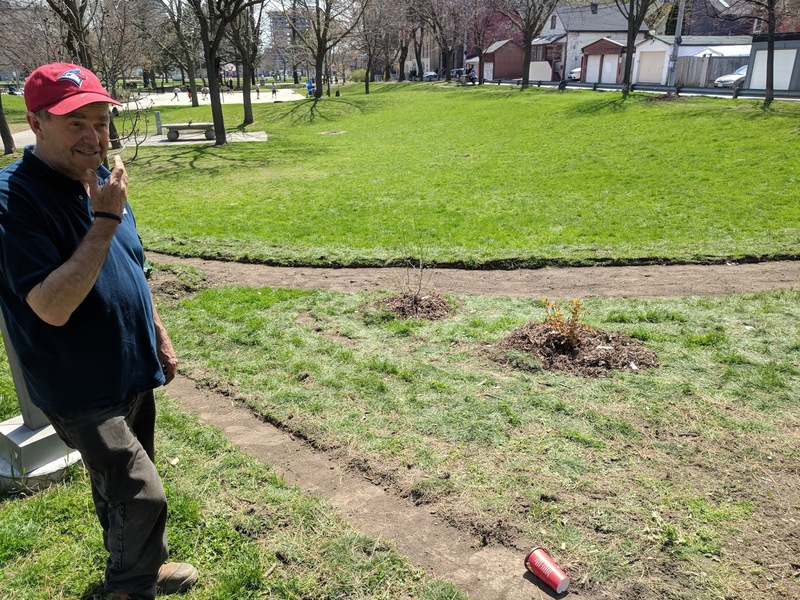 Brian got it going and Harry guided it over the large crescent-shaped patch on the hillside where the perennial pollinator garden will be planted. The sod stripper is an amazing device! It passes a cutter blade about 2cm (an inch) under the grass, leaving you with a strip of sod which is easy to lift up and move afterwards. Brian and his team will be bringing in coarse sand as a mulch/surface for the perennial bed. 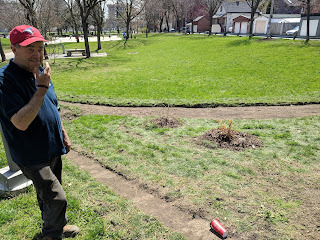 In my experience, sand makes an excellent mulch, and in a sunny, sloped spot like we have it reduces weed seed sprouting. Another possible benefit we'll have to wait to see is that ground-nesting native bees love a sandy, sunny slope. I've seen hundreds of their nest tunnels in the sandy hillside of High Park above Grenadier Pond. I'm sure they will eventually find their way to this idyllic nesting spot - sand surface, soft soil underneath, and lots of flowers through the seasons. It looks like you and the city are doing a wonderful job! 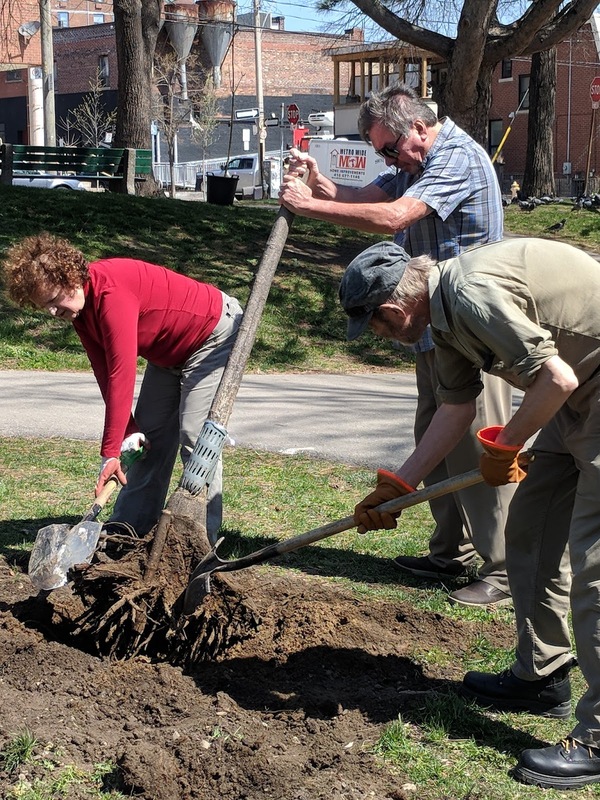 Thank you to all for working to make the Kathy Grove a wonderful spot. Thank you all for helping to make the Kathy Grove a reality!! Xoxoxo to everyone involved.